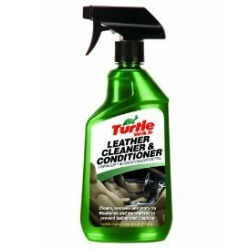 John provided this review of Turtle Wax Leather Cleaner & Conditioner, which he used in both his home and his car. This is a good product. It's readily available at larger chain stores as well as local auto parts stores with a car care section. It leaves a light leather scent that tends to stick around for several days after cleaning. After spraying liberally on the seat of my daily driver SUV and letting it sit about 5 minutes, I took a white rag to the seat and could see a large amount of soil, dust, etc. come off the seat. I have since used it on my precious Mercedes coupe, as well as all leather surfaces of my home, including two leather chairs. It cleans them all very well, with no ill effects, no sunbaking, cracking of the leather etc. after use. If you are looking for an inexpensive, quality product I would highly recommend Turtle Wax's leather cleaner and conditioner to anyone. Thanks for your review of this product John. I'd love to hear from even more people who've used this product for their cars, or other items in or around their home. You can share your car upholstery cleaner reviews here, or read others that have already been submitted. Further, check out these pages with leather cleaner reviews and leather conditioner reviews, if you're looking for this type of product. Join in and write your own page! It's easy to do. How? Simply click here to return to auto upholstery cleaner.